Daily Getaways: Certificate for three (3) nights in a Piazza Suite at The Venetian, Las Vegas, for $650. Offers ends May 4, 2018 or when sold out. Daily Getaways: Certificate redeemable for three (3) nights in a Siena Suite at The Palazzo, Las Vegas, for $850. Offer ends May 4, 2018 or when sold out. JetBlue: May the Fourth sale: Get 25% off the base fare on select flights, using codes (multiple codes, based on Star Wars episodes – very cute. See web page for codes). Offer ends May 5, 2018. Frontier: May the Fourth sale – save 54% with promo code FORCE. Offer ends May 4, 2018. Thrifty Car Rental: Pay now and save up to 20% on your car rental’s base rate through May 4, 2018. Hertz Car Rental: Pay now and save up to 25% off the base rate for rentals through May 4, 2018. — Applebees: Get $1 Dollaritas and $2 Dos Equos drafts on May 1-5, 2018. — Hungry Howie’s Pizza: Use coupon promo code CINCO18 to get a 1-topping large pizza for $5.55. Offer available only for takeout and only for online orders or by using the Hungry Howie App. Good May 1-5, 2018. You must be a registered user to get the $5.55 special. — Bahama Breeze: Get Classic Margaritas for $5 through May 5, 2018. — El Torito: food and drink specials on May 3-5, 2018. Specials vary by location. — Fleming’s Steakhouse: Will offer a special $100 Prime Margarita, available May 4-6, 2018. Is handcrafted with ultimate premium liquors, including Tequila Herradura Selección Suprema and Grand Marnier Centenaire. Served in Baccarat’s uniquely designed Diamant Highball, guests will take home the glass in Baccarat’s iconic red box. — Bubba Gump Shrimp Co.: Get $1 Tacos and $4 Corona Extras all day on May 5, 2018. — El Pollo Loco: $10 off a 24-piece catering order or $20 off a 48-piece order. In addition, Rewards members will get double points on any purchase. Offer good with coupon – coupon will be in link when El Pollo Loco posts it. 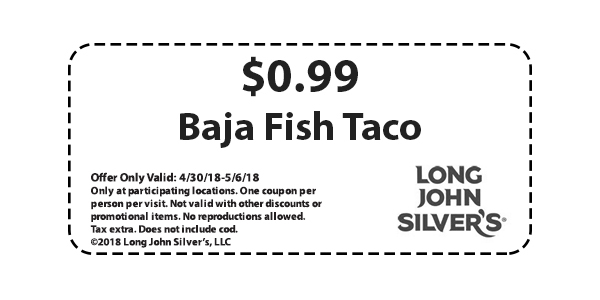 — Long John Silver’s: Get a Baja Fish Taco for 99 cents with this Long John Silver’s coupon. Show to your server to get a Baja Fish Taco for 99 cents. Coupon is valid April 30 – May 6, 2018. — On The Border: has Cinco ‘Ritas for $5 on Cinco de Mayo. Many locations will have other specials, with some deals good May 4 – 6, 2018. — Tijuana Flats has three days of deals starting Friday, May 4, 2018. Get $2 Tacos and $2 Mexican Beers all weekend, May 4-6, 2018. 50¢ extra for steak. Excludes fish and Megajuana items. $2 Mexican Beers available all day 5/4-5/6 in FL, GA, NC, VA, and IN. $2 Mexican Beers available 4pm-8pm 5/4-5/6 in SC. Target Car Seat Trade In Event: Bring your old used car seat into your local Target and receive a coupon good for 20% off any car seat – valid in store or at Target.com. Offer valid through May 5, 2018 and 20% off coupon will be valid through May 19, 2018. SeaWorld Florida: Free 2018 Sea World Florida preschool card for Florida residents age 5 and younger (pass valid through Dec. 31, 2018) Offer ends May 20, 2018. Choice Hotels: Stay two separate times between today and May 25, and you can earn enough points to redeem for a future FREE night. Choice Hotels include Econo Lodge, Clarion, Comfort Inn, Sleep Inn, Rodeway, MainStay, Comfort Suites, Ascend & Quality Inn (offer valid through May 25, 2018). Tibby’s New Orleans Kitchen: $2.99 Hurricanes from 2pm to 6pm (offer ends May 31, 2018). Enterprise Rental Car: One way car rentals from Florida, starting at $9.99 per day (pickup through May 31, 2018) (offer ends May 31, 2018). Enterprise Rental Car: One way car rentals between downtown San Francisco and nearby airports, starting at $9.99 per day (offer ends May 31, 2018). Enterprise Rental Car: One way car rental specials from Arizona, starting at $29.99 per day (pickup through May 31, 2018) (offer ends May 31, 2018). Walt Disney World Vacation via Southwest Vacations: Book a flight + Walt Disney World hotel vacation package and save up to 25% on select hotels. Travel must take place between May 28, 2018 and August 30, 2018. Offer ends 6pm CT on May 22, 2018. Chili’s: Tequila Trifecta for $5. Offer ends May 31, 2018. Accor Hotels: Save 30% off stays at select Accor hotels through Dec. 31, 2018 (Offer ends May 31, 2018). Genghis Grill: Get a combo for $9.99 with coupon (coupon in link). Offer ends June 1, 2018. Previous Previous post: Universal Orlando Tickets vs. An Annual Pass: Which Should You Get? Next Next post: Getting Married? You Can Be Registered For Your Honeymoon!